Hadrian’s Wall – one of the most prominent monuments of the Roman period in Britain – has a special place in the public imagination. It offers a tangible reminder of our ancient past and a concrete link with the Roman occupation. Visitors can stand amid the remains, knowing that they tread in the footsteps of the soldiers who garrisoned the province. Guides to the Wall have tended to concentrate on the archaeological record, on the Wall’s construction and on military organisation. 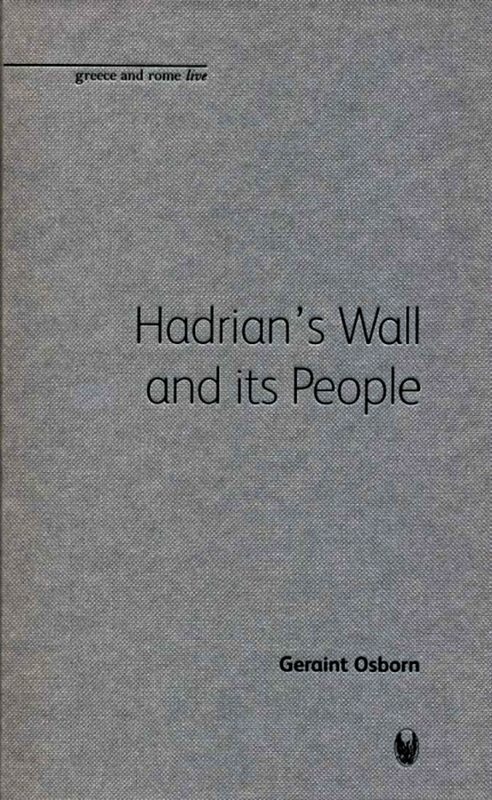 This book folds these aspects into a wider historical, social and economic perspective, providing the general reader with an analysis of how Hadrian’s Wall functioned. It describes the impact it had on the lives of both Rome’s soldiers and the native population, dealing with the contentious issue of ‘Romanisation’. It looks, too, at what happened in Christian communities of the Wall area after the Roman army’s departure. Geraint Osborn utilises archaeological evidence, including the content of the remarkable Vindolanda tablets, to give a rounded picture of military life on the Wall. He also considers the role of the monument in the context of Victorian England, a time when parallels were frequently drawn between the Roman and British empires, and how this in turn affected the excavation, preservation and modern presentation of Hadrian’s Wall. …the dividing Wall has become an important historical landmark for British national identity, a tourist spot for families on vacation, and an educational destination for British school children. Geraint Osborn…has written a short, concise book on a landmark that is fundamental to the British consciousness of the past. As a result, this book is targeted specifically for a general audience, hopefully one that either has visited or will visit the remains of the Wall. Overall, the book is easy to read, the narrative flows well, and there are many subheadings within the chapters that keep the pace moving at an appropriate rate for an introductory text. In such a short space of only 116 pages the author does an exceptional job of introducing the major topics, areas of research, and debates surrounding this subject. Arguably, the true aim of this book is to enhance the educational experience of British citizens, curious tourists from abroad, and young school children visiting the Wall itself. If this is the intent of Hadrian’s Wall and its People, it is this reviewer’s opinion that Osborn is successful. Geraint Osborn reussit ici un exercice difficile en parvenant a ecrire a la fois un bon livre de vulgarisacion et un introduction scientifique correcte. C’est en effet un ouvrage parfait pour la chercheur voulant avoir rapidement une idee large de ce qu’etait le mur d’Hadrien et la vie de ceux qui y residaient. Geraint Osborn has taught Ancient History in the Universities of Bristol, Cardiff and Durham. His main work has been on Roman Britain and Gaul and on the history of the later Roman empire.